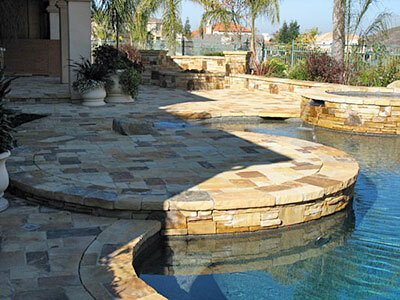 Saratoga Pavers provides professional design, installation, and maintenance of all phases of landscaping, irrigation, lighting, pavers, walls, ponds, waterfalls, fountains, and outdoor fireplaces and kitchens. Saratoga Pavers is at the forefront of paving stone installation. We enjoy what we do, are constantly striving for excellence and warranty our work from the ground up. We believe that as people become aware of the superiority of a segmental pavement and that as we continue to require our customer's overwhelming approval of our installations, Saratoga Pavers will continue to be a dynamic leader in an expanding industry. Steven E. Smith (owner) grew up in Silicon valley working for his Fathers company Carl Smith Plumbing where we did all the plumbing for the Eichler homes with the radiant heat. During his years in the family business he learned about doing the job right the first time as that is how his Father trained him. Attending a four year apprenticeship program with local 393 of San Jose, CA fine tuned his skills for commercial, process piping, and custom homes. Steven then furthered his passion with customizing his own home and then family and friends. It was back in 1993 when he witnessed a paver stone driveway Southern CA. He was amazed by the look and the European style that made him feel the energy that gave strength, stability and beauty that could last a many lifetimes. He realized the final look was determined by the underground and preparation. With his experience in the plumbing business working for his dad in the sixties and seventies he was taught to that grade, proper back fill and compaction was needed for a proper installation. Steven fell in love with the work and people could see the final result as gorgeous where as plumbing it usually is not seen after taking pride in all that good work. This when he decided to go to the next level and first did his own home, then family's homes and then friends and it is has now become a passion to help people get that driveway, patio that they deserve. Steven wants homeowners to know that his experience in underground has made him the elite person for your job and has now been serving this valley with quality driveways since 1995. Call him direct and know you will be treated with respect with the end result in mind to achieve that look you're looking for with a fair and honest investment back into your home.